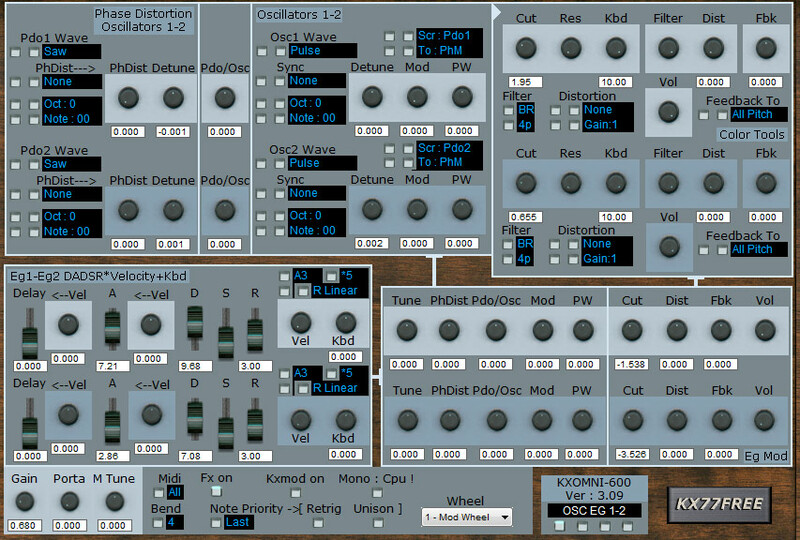 KXOMNI-600 is an analog and phase distortion synthesizer with KXMOD system. Each Layer (the plugin is stereo) is composed of two oscillators: a “Phase Distortion Oscillator” (Pdo) and an “Oscillator” (Osc), the oscillator signal is filtered by a “Multimode Filter”, a “Distortion” and a “Feedback”. All the modulations are controlled by an envelope generator, the velocity and the keyboard. Then the sound (4 oscillators + 2 filters…) is filtered by a stereo VCF (undoubtedly one of the most complete vcf avaliable in freeware) and a VCA. All the modulations of the oscillators can be modulated by a double LFO.